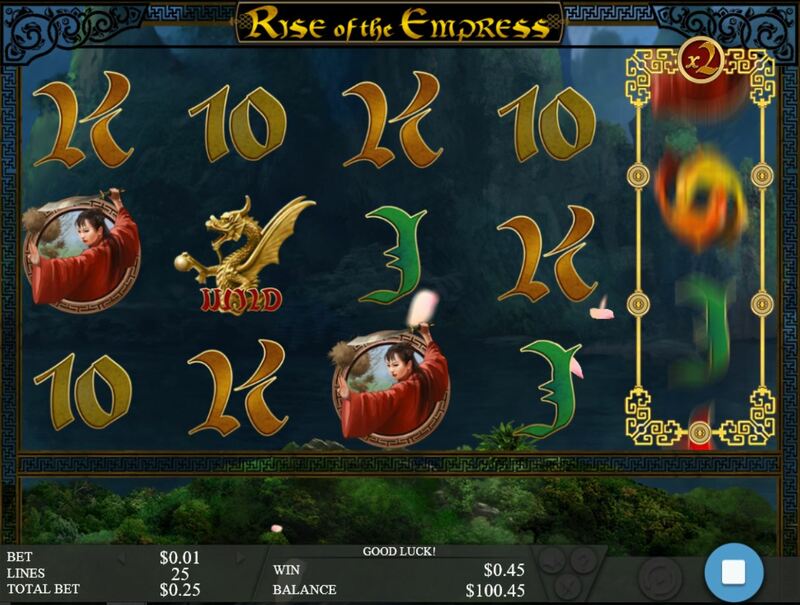 Rise of The Empress slot is an Oriental-themed slot, with plenty of unique features. 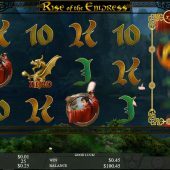 Genesis Gaming have been around for a while and indeed developed some of the first slots you see on the Microgaming Quickfire platform such as Yggdrasil Tree of Life and Mystique Grove. This slot has 25 paylines over 5 reels and 3 rows packed with features! We have non-multiplying Wilds appearing on the last 4 reels in the form of a Dragon and the highest-paying symbol is the Empress herself paying a respectable 50x stake for 5-of-a-kind down to the lowest card symbol the 9 at 2x stake for the same. This brings us to the first in-play feature. Should you get any 4 or 5-of-a-kind win the 5th. reel will respin, thus in the case of a 4 reel win you may get the 5th. symbol land, or if you already had the 5-reel win the win may repeat with a Wild or another of the same. If this occurs, you also get an increasing multiplier for successive 5-of-a-kind wins, up to a maximum of 5x. This isn't all as the 5th. reel also has a bonus symbol on it which will trigger a different enhancement. If your 4-reel win was formed by either 9, 10 or J then the bonus will be a simple pick-me for 2-10x stake should it land. The respins then carry on. If you triggering 4-reel win was Q, K or A then the bonus symbol will award you any 2 of the last 4 reels as full reel Wilds for that spin before the respins continue. Perhaps the best of the 3 possibilities is the Mixed 10 Free Spins which you get if the 4-reel triggering win was formed by any of the picture symbols. In these the high-paying picture symbols pay any mixed. You don't get the 5th. reel respin feature during these 10 mixed spins. Should you land Ying and Yang Goldfish symbol on reels 1, 3 and 5 you are awarded 10 free spins. These can be retriggered and all the in-play bonuses and respins described above are available during these spins. There is no multiplier but you will notice the game is more prolific with bestowing the Empress's riches upon you!